In a shallow bowl, mix flour, garlic salt and pepper. Dip chicken thighs in flour mixture to coat both sides; shake off excess. In a large skillet, heat oil over medium heat. In batches, brown chicken on both sides. Transfer to a 4-qt. slow cooker. Sprinkle garlic, lemon zest, thyme and rosemary over chicken. Top with artichoke hearts, olives and bay leaf. In a bowl, mix orange juice, broth and honey; pour over top. Cook, covered, on low 4-5 hours or until chicken is tender. Remove bay leaf. Reserve four chicken thighs for Double-Duty Chicken & Feta Spinach Salad; cover and refrigerate. 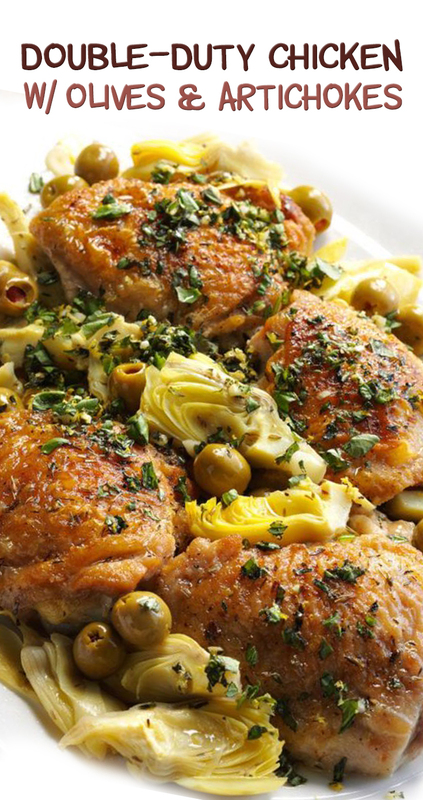 To serve remaining chicken, mix gremolata ingredients in a small bowl. Sprinkle over chicken and artichoke mixture.